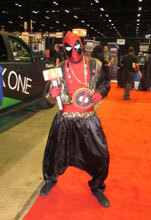 Here’s the story of ReedPOP's C2E2 2014 at McCormick Place on the Chicago lakefront. Friday always has a thinner crowd, with special time for trade and professionals in the morning and a more relaxed vibe all day, which gave us a chance to check out the booths and the early cosplayers. To see the rest of the Friday photos, go to Part 2. 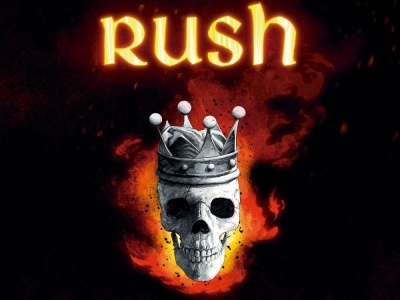 NOTE: Any image can be clicked for a larger view. The Stan Lee signing at the Marvel booth on Friday drew quite a crowd. These four, Ms. Marvel, Scarlet Witch, Mera, and Black Widow radiated attitude. 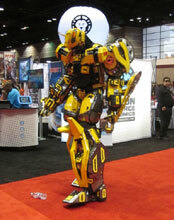 This ultra-tall movie version of Bumblebee is confused by the abandoned water bottle he encountered. 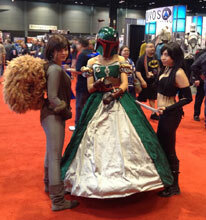 A high quality cosplay trio--Squirrel Girl, Princess Fett, and X-23. 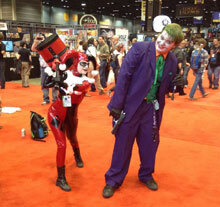 Cosplay staples Harley Quinn and the Joker. 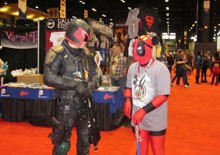 "Deadmouse" Deadpool taunts Judge Dredd. 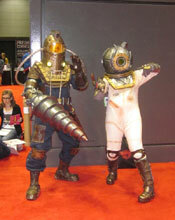 Castor and Gem from Tron: Legacy. 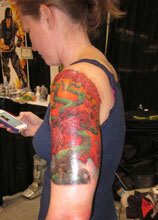 This woman sat for nearly five hours for new ink in the tattooing area, which had at least 20 different artists. 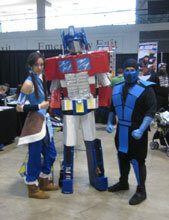 Korra, Optimus Prime, and Sub Zero check out the Ink-Fusion tattoo area. 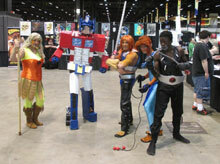 Optimus was also hanging with Thundercats. Not one but two Powergirls. Groot from Guardians of the Galaxy strikes a pose.